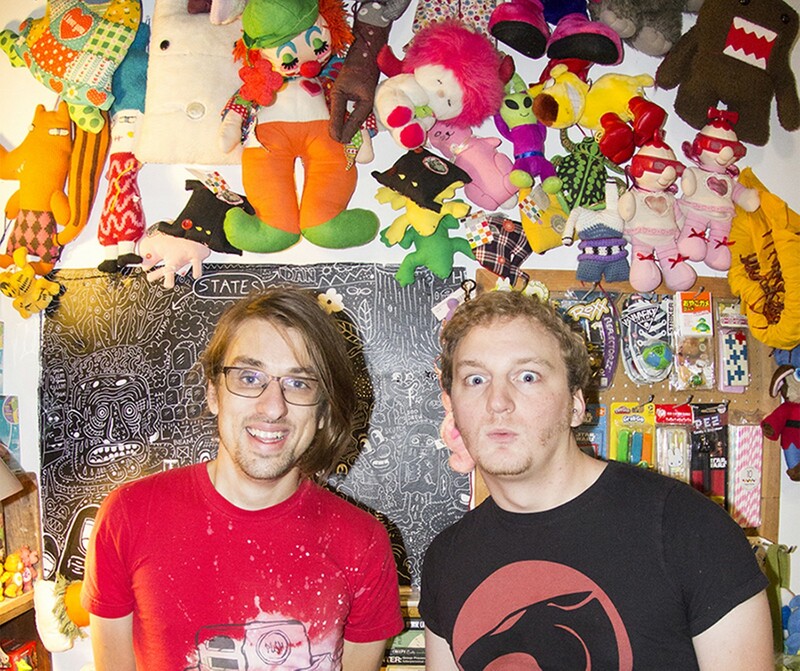 David Wolk and Nick Wetzel, surrounded by wares from Cranky Yellow's life as a curio shop. 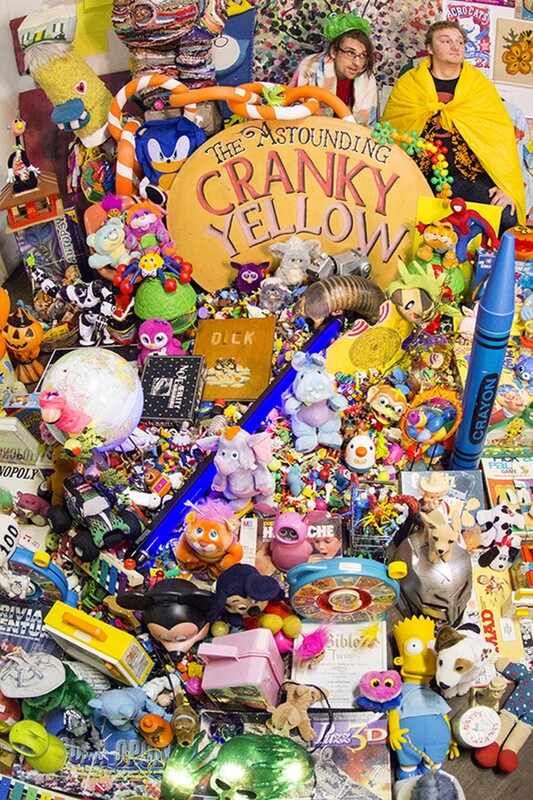 The name "Cranky Yellow" has long stood as a catch-all title for artist David Wolk, who has craftily kept the brand fluid for the past eleven years. From its early start in 2005 as a publisher of t-shirts, stickers and prints to three separate, now-shuttered storefronts on Cherokee Street, Cranky Yellow has become the umbrella covering Wolk's many works. Its latest incarnation is Am The Death, an ongoing audio-visual album in collaboration with songwriter Nick Wetzel. "It's pop music, so it's superficial and supposed to be fun, but it's also crazy because Cranky Yellow is crazy," Wolk jokes. 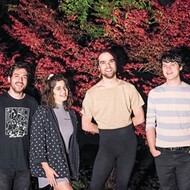 He and Wetzel like to call their songs "fuzz pop," owing to the dense-yet-outlandish style of the work. When writing songs, Wolk will hum or form a tune with his voice, which Wetzel then translates to ukulele while working out rhythm and structure. 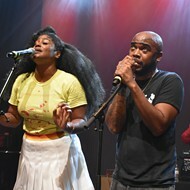 The duo then commits the skeleton of each song to a computer using the recording software Logic Pro; the sound is then expanded using guitar, live drums and multiple synthesizers, among other instrumentation. "Whenever we begin on the ukulele, the songs all sound like 'Over the Rainbow,' but by the time production is finished they are standalone songs," Wolk says. "After the digital processing happens, after the song goes from being in real life to in the hard drive, it always sounds completely different," Wetzel agrees. "You know you're doing things right when it finally feels good." From recording to mixing and mastering, Wetzel counts on Logic Pro to build Cranky Yellow's distorted pop. Any gaps left by the live instruments are filled in by dual vocals, which the pair provides through layers of singing, shouting and banter filtered through a mesh of tone-twisting effects. "He has the ability to lay it out, but I can hear whenever it's right or wrong, so I just basically sit there while we're mixing and say yes or no," Wolk explains. 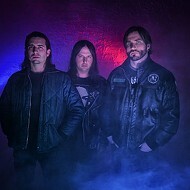 While this approach might seem like backseat driving, Wolk has a rightful claim to the wheel, having worked in music for several years in both supporting and starring roles. Wolk first opened the Cranky Yellow store in 2007 as a small shop focused on handmade goods. He sold local music on consignment, and after hearing songwriter Dora Magrath sing outside of the Starbucks on Delmar Boulevard, he sought to expand Cranky Yellow into a record label as well. Magrath's Heartstrings was released in January 2008, but the album now has the aura of tragedy: The young singer passed away two months later. Wolk abstained from music for the next year until moving Cranky Yellow to 2847 Cherokee Street, in the building that now holds Blank Space. This new space offered three floors to work with: The upstairs was Wolk's home and workshop while the main floor offered a larger store filled with vintage clothes, artwork and an even wider range of handmade items. 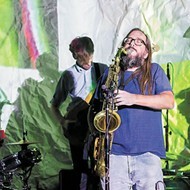 Wolk loaned the basement to bands and DIY music promoters for low-key concerts — a practice that would continue long after Cranky Yellow left the building in June of 2011. "It was a very tumultuous time so I was very ate-up," Wolk admits. "Cranky Yellow closed, and obviously closing didn't make it all better, because the store was so much of who I was." Wolk's next endeavor would come as a surprise to himself and his friends alike. 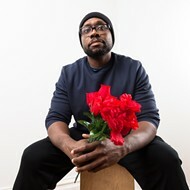 In 2012, he made his first foray as a musician with Charm Ape, a one-man theatrical rap opera spanning 45 minutes and performed for one night only. "I guess the spoken word and rap was just kind of a medium at the time," Wolk says. "I wasn't expecting it, it just started coming to me and I had to honor it." His work with Charm Ape would lead to another stage show nearly two years later with Foster & Fortitude, a play about reuniting with your creativity. 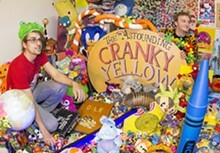 This project was the first of many for Wolk and Wetzel, and would later form the foundation of Cranky Yellow as a musical entity. In collaboration with Upcycle Exchange owner Autumn Wiggins, Cranky Yellow reappeared as a pop-up shop in Union Station for Strange Folk Festival 2015. As part of the event, Wetzel's punk band the Chemical War performed and released The War Came Swiftly, a World War II memorial album also produced by Wolk. Following the festival, a third Cranky Yellow store opened in a shared space on Cherokee Street with Upcycle Exchange. Its lifespan would be the shortest to date. "We snuck out in the middle of the night," Wolk says. "Autumn and I just decided that it was over, and that's when Nick and I started writing a pop musical." For him, the new project mirrors his Charm Ape debut, serving as a therapeutic process after closing up shop. Cranky Yellow's Am The Death is currently being released through the brand's Facebook, SoundCloud and YouTube pages. The pair uploads a new song every two weeks; a music video follows seven days later. 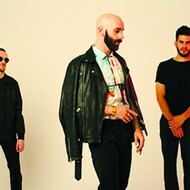 Owing to Wolk's reputation for multifaceted art, the visuals for Am The Death are equal partners with the music, while subtle stories arc through multiple songs. "I discovered that the important thing for me is that the store's atmosphere doesn't actually have to be a store," Wolk says. "Just being surrounded by the things, you know?" Following the digital campaign, the pair will release Am The Death on CD, with sights set on a later vinyl edition. 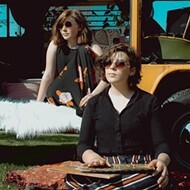 Wolk and Wetzel plan to take Cranky Yellow on the road, playing small venues and art spaces throughout the U.S.
"Everything that I have been doing for over ten years has been about creating, promoting, seeing and hearing art," Wolk says. "And it takes a lot of different forms. I'm not satisfied with just selling handmade things or being a theatre company. I also want to perform."